Smartphones are everywhere, and we love to have them in our hands. There has been a lot of controversy in the past regarding the fact that how much the radiation coming out from the phones affect us. In fact, there is a majority of people thinking that the radiation from smartphones can cause cancer. But, recent research has revealed that the cellphone radiation possesses no real harm to humans. Still, if you want to keep yourself as safe as possible, it would be good for you to know how much radiation phones emit. A data from the German Federal Office for Radiation Protection (Bundesamt für Strahlenschutz) has revealed that the Xiaomi Mi A1 is the smartphone that emits the most radiation while used for calling. 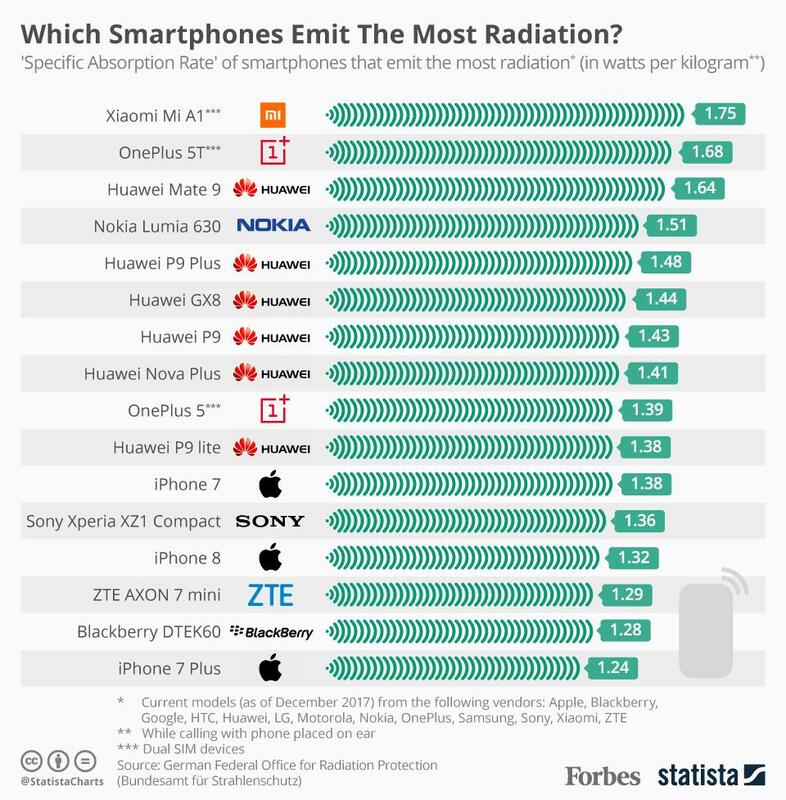 The list of phones that emit the most radiation shows that the top 3 spots include Chinese smartphones like Xiaomi Mi A1, OnePlus 5T and Huawei Mate 9. But, the list also includes iPhones and Blackberry phones. The phones are listed regarding the SAR value or Specification Absorption Rate. If you don’t know, only those phones are certified by Blue Angel (German certificate for environmental friendliness) which have SAR value below 0.60 watts per kilogram. The list shows that the SAR value of Xiaomi Mi A1 is 1.75 watts per kilogram which is much higher than the recommended rate mentioned above. In fact, all the phones in the list have SAR value higher than 1.2. It is worth mentioning that among all the 16 phones in the list, 10 are from Chinese manufacturers like Xiaomi, Huawei, OnePlus, ZTE, etc. But, as mentioned above, the radiation coming from your phone doesn’t do any harm to you. What are your views on this? Do let us know via the comments section. Like usual this type of article focuses on only a certain aspect of cell phone radiation that doesn’t give the whole picture. Of course, I would have to read the whole study, but the arguments are not sufficient to make me believe that cell phone radiation is not a problem. There are 2 important statements in the article. The tests have been done with 2g and 3g. 4g is believed to require more energy than the rest so it should be tested as well. Also, in the article they said that cancer rate has not increased. Compared to when? If you want to make the article informative, other information needs to be given: what were the levels of the radiation, how many hours in total were they exposed to radiation? Also what all of us need to take into account is that we are not exposed to just 2g and 3g,and not just from our phone. Many people have wifi and bluetooth enabled permanently, some have 2 or 3 phones with them, and wifi hotspots are everywere. In a big city I get an average of 10 wifi signals and in a bus or subway there are 5 people almost stuck to me with their phones. We are bombarded with radiation from all directions and if you want a realistic assesment of the levels you need to study it from all of this forms. Also, I don’t think I’m an alarmist, but I am getting tired of inconclusive results from this kind of studies, something seems fishy about it. This study is not sufficient to convince me that cell phone radiation can be ruled out as a cause for cancer!